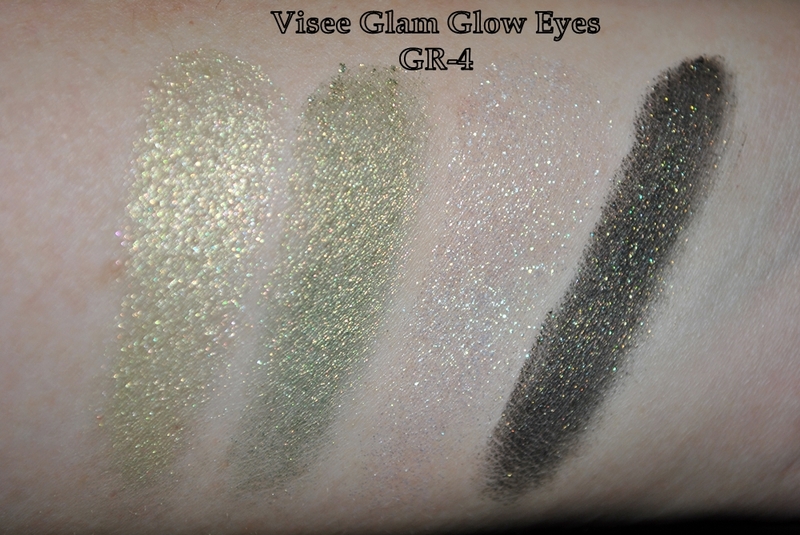 Hi everyone, today I have another palette from the Visee Glam Glow Eyes collection to share. I rarely venture out of my neutral territory and this is my first green anything in my stash. So without further ado, here’s GR-4. I’d like to say that I’m superbly impressed with this quad the minute I touched the first pan of color; it is smoother and silkier as compared to BL-5. Color-wise, the nuances of green is definitely more visible. And the beautiful embossing on the compact cover! Thank goodness it’s not a one-swipe-gone else I’ll be left beating my chest. Close-ups of the gorgeous green in GR-4. Swatches. The colors are as per the numbered shades from the picture of the quad above, i.e. clockwise from top left. 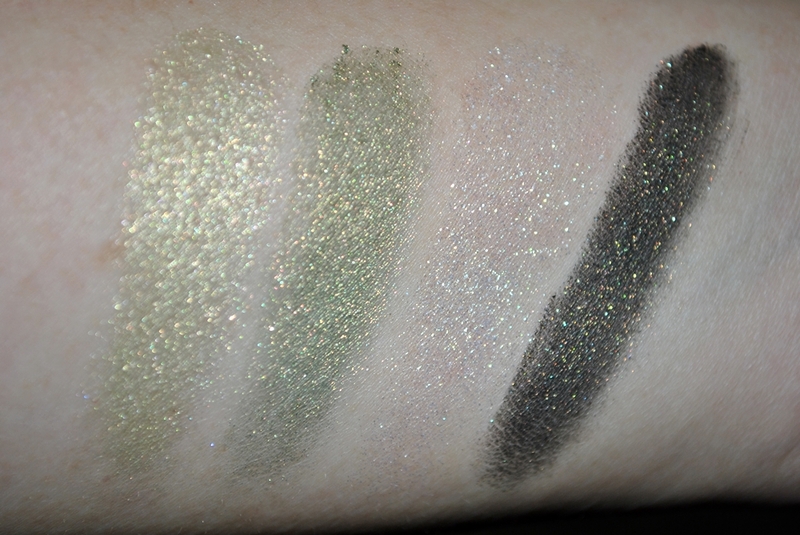 These are swatched without any primer. #1 is a yellow-olive. 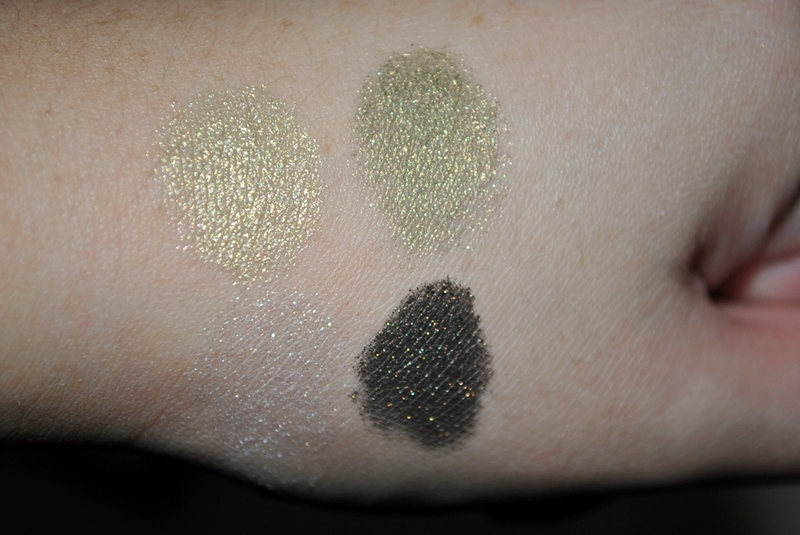 Smorgasbord of glitter, as you can see from the swatches. #2 has more green in it than #1. But not an olive yet, has yellow tones. I imagine it would perk up the eyes very nicely indeed. #3 is just a sad sparkly shadow. 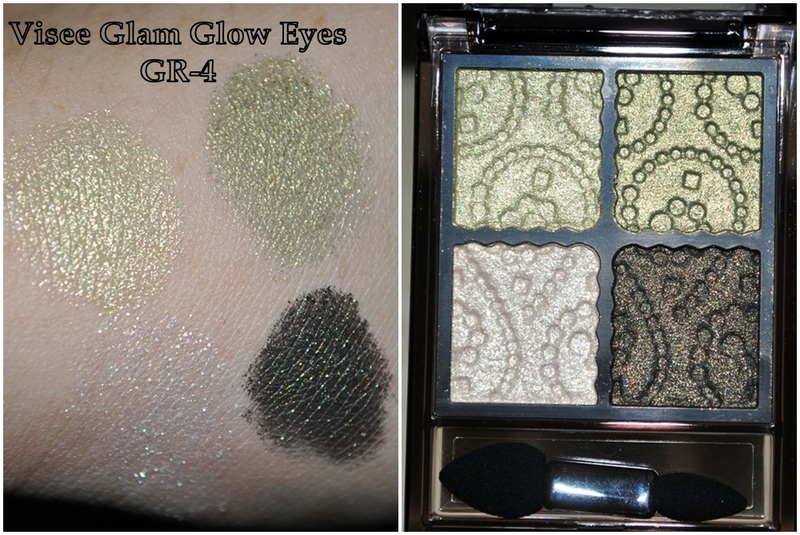 Same as the #3 in BL-5, this does not have enough ‘color’ to the shadow and simply shows up as glitter. #4 is a very nice black with some discernible green. 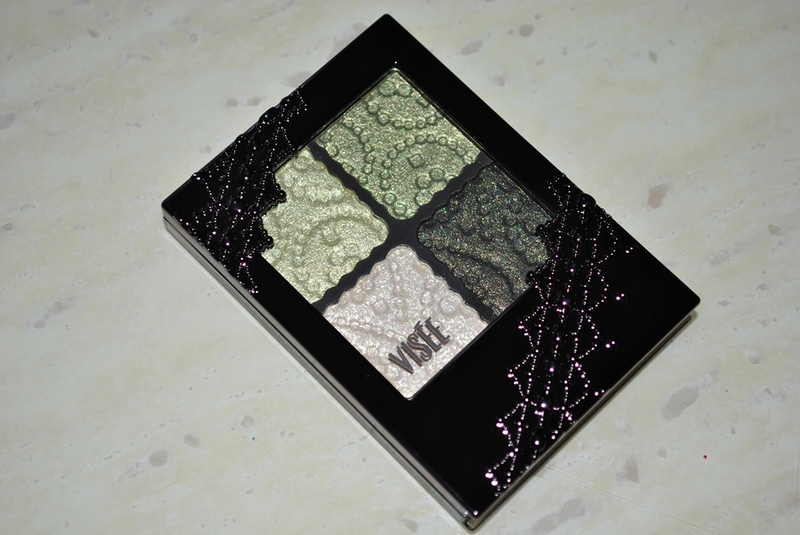 It’s not harsh and unforgiving like a true matte black, but with similar green-colored glitters to soften and round up the look. Ahhhh, very nice~~~~~ And I’m pleased with how the swatches turn out this time. This saves me alot of time describing the colors because they photograph true to swatch. Though the glitter probably wouldn’t jump out so much, but still. So pretty! 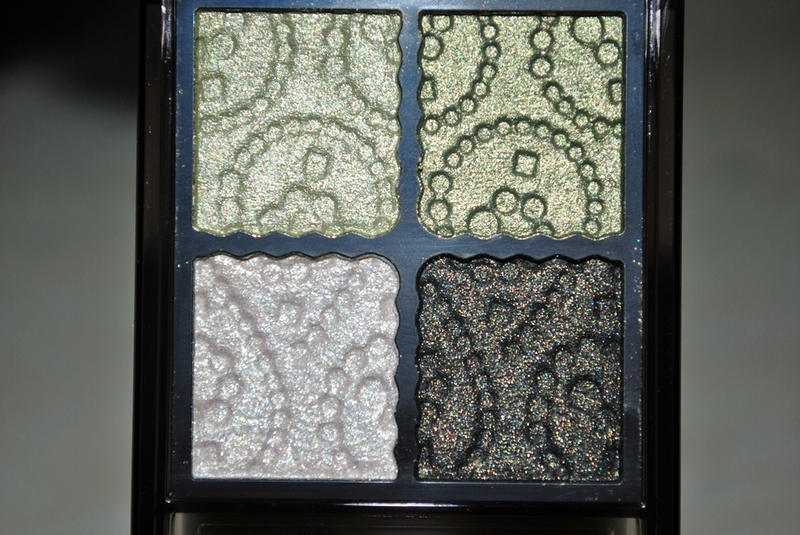 You can see more of the color instead of the glitter once you pat the shadow over UDPP. And #3 is still a sad mess. Haha. What can I say? 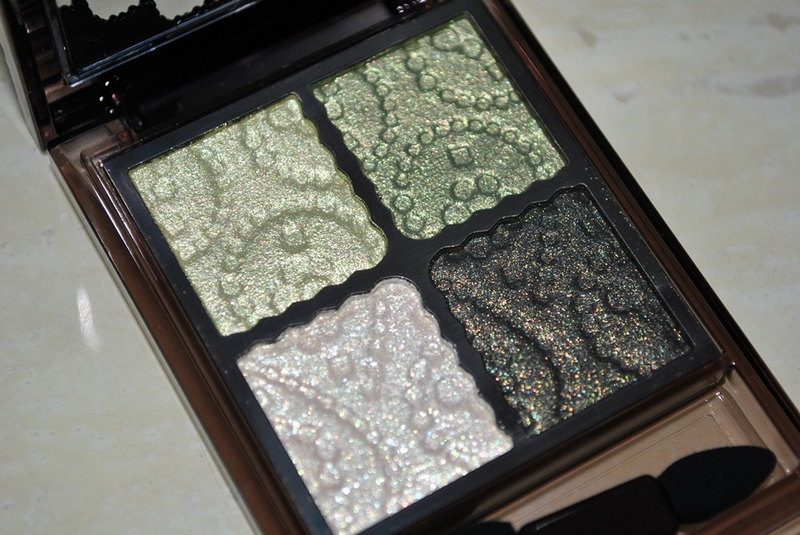 This quad beats BL-5 in terms of pigmentation, with only one out of four shades a dud. 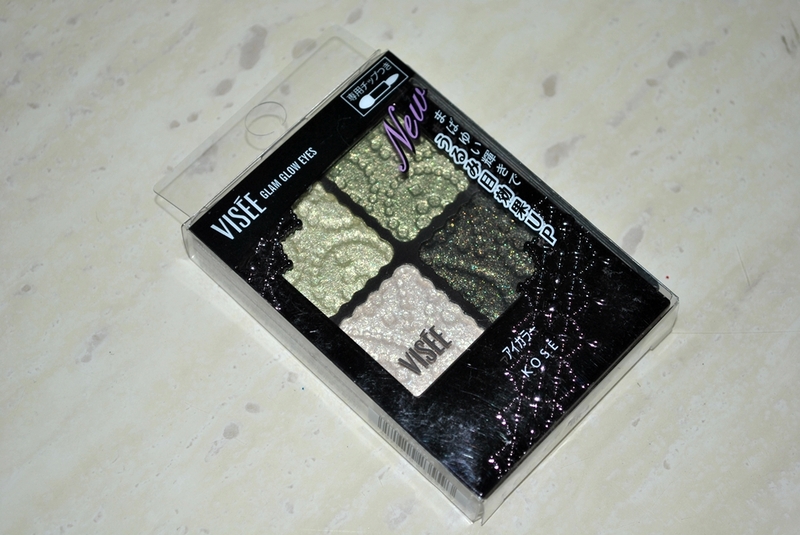 Very smooth powder and I have to say, I’m quite impressed with the quality of Visee shadows in general, at least for hand swatches. You don’t feel the grit of the glitter, even though there’s a whole lot of it. 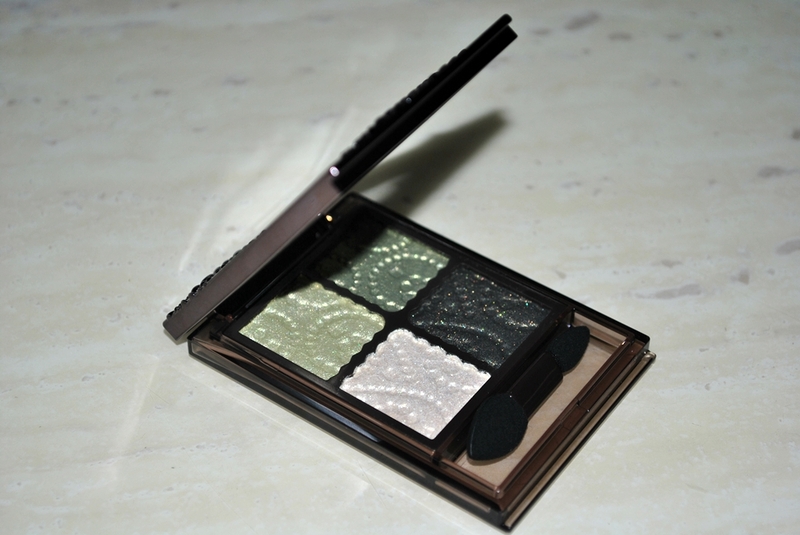 Very wearable shades, and I think the Armani Eyes to Kill in #6 Khaki Pulse can lend some of its darker olive tones to this quad for a really nice look. Very pretty palette. I really like your photos, the colours of the shadows are gorgeous. Do an eye look sweetie we want to see.